Wolfram Alpha: Google + Wikipedia? Think about that for a minute. It computes the answers. Wolfram Alpha doesn’t simply contain huge amounts of manually entered pairs of questions and answers, nor does it search for answers in a database of facts. Instead, it understands and then computes answers to certain kinds of questions. Wolfram Alpha is a system for computing the answers to questions. To accomplish this it uses built-in models of fields of knowledge, complete with data and algorithms, that represent real-world knowledge. For example, it contains formal models of much of what we know about science — massive amounts of data about various physical laws and properties, as well as data about the physical world. Based on this you can ask it scientific questions and it can compute the answers for you. Even if it has not been programmed explicity to answer each question you might ask it. But science is just one of the domains it knows about — it also knows about technology, geography, weather, cooking, business, travel, people, music, and more. It also has a natural language interface for asking it questions. This interface allows you to ask questions in plain language, or even in various forms of abbreviated notation, and then provides detailed answers. The vision seems to be to create a system wich can do for formal knowledge (all the formally definable systems, heuristics, algorithms, rules, methods, theorems, and facts in the world) what search engines have done for informal knowledge (all the text and documents in various forms of media). Fifty years ago, when computers were young, people assumed that they’d quickly be able to handle all these kinds of things. And that one would be able to ask a computer any factual question, and have it compute the answer. But it didn’t work out that way. Computers have been able to do many remarkable and unexpected things. But not that. I’d always thought, though, that eventually it should be possible. And a few years ago, I realized that I was finally in a position to try to do it. I had two crucial ingredients: Mathematica and NKS. With Mathematica, I had a symbolic language to represent anything—as well as the algorithmic power to do any kind of computation. And with NKS, I had a paradigm for understanding how all sorts of complexity could arise from simple rules. But what about all the actual knowledge that we as humans have accumulated? A lot of it is now on the web—in billions of pages of text. And with search engines, we can very efficiently search for specific terms and phrases in that text. But we can’t compute from that. And in effect, we can only answer questions that have been literally asked before. We can look things up, but we can’t figure anything new out. So how can we deal with that? Well, some people have thought the way forward must be to somehow automatically understand the natural language that exists on the web. Perhaps getting the web semantically tagged to make that easier. But armed with Mathematica and NKS I realized there’s another way: explicitly implement methods and models, as algorithms, and explicitly curate all data so that it is immediately computable. It’s not easy to do this. Every different kind of method and model—and data—has its own special features and character. But with a mixture of Mathematica and NKS automation, and a lot of human experts, I’m happy to say that we’ve gotten a very long way. But, OK. Let’s say we succeed in creating a system that knows a lot, and can figure a lot out. How can we interact with it? The way humans normally communicate is through natural language. And when one’s dealing with the whole spectrum of knowledge, I think that’s the only realistic option for communicating with computers too. Of course, getting computers to deal with natural language has turned out to be incredibly difficult. And for example we’re still very far away from having computers systematically understand large volumes of natural language text on the web. But if one’s already made knowledge computable, one doesn’t need to do that kind of natural language understanding. All one needs to be able to do is to take questions people ask in natural language, and represent them in a precise form that fits into the computations one can do. Of course, even that has never been done in any generality. And it’s made more difficult by the fact that one doesn’t just want to handle a language like English: one also wants to be able to handle all the shorthand notations that people in every possible field use. I wasn’t at all sure it was going to work. But I’m happy to say that with a mixture of many clever algorithms and heuristics, lots of linguistic discovery and linguistic curation, and what probably amount to some serious theoretical breakthroughs, we’re actually managing to make it work. Pulling all of this together to create a true computational knowledge engine is a very difficult task. It’s certainly the most complex project I’ve ever undertaken. Involving far more kinds of expertise—and more moving parts—than I’ve ever had to assemble before. And—like Mathematica, or NKS—the project will never be finished. But I’m happy to say that we’ve almost reached the point where we feel we can expose the first part of it. It’s going to be a website: www.wolframalpha.com. With one simple input field that gives access to a huge system, with trillions of pieces of curated data and millions of lines of algorithms. We’re all working very hard right now to get Wolfram|Alpha ready to go live. Wolfram Alpha computes to factual questions. This is going to be big. Google Quotient: How relevant are you online? 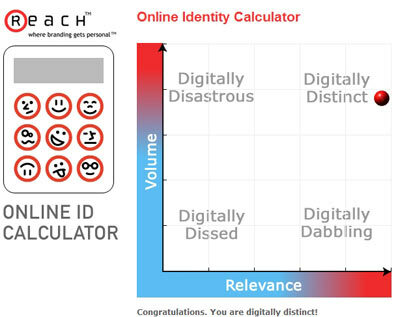 Like the idea of an online brand calculator to determine how your personal brand is findable on Google and whether you are Digitally Distinct, Digitally Dabbling, Digitally Dissed or Digitally Disastrous. - 83% of recruiters use search engines to learn about candidates and 43% of recruiters admit to eliminating candidates based on information they found online ( ExecuNet Study, 2007). - Today’s employees change their jobs on the average every two years, their companies every three, and their industries every four (US Department of Labor). - Corporate leaders are changing companies every 3.2 years down from 3.6 years in 2005 and 4.1 years in 2002 (ExecuNet surveys). For chief marketing officers, at the world’s top-100 branded companies, tenure is just under 2 years (2004 Spencer Stuart survey). PDF Excerpt from Career Distinction. Welcome to Julian Matthews' blog. I'm a former journalist and Malaysian correspondent for CNet, ZDnet, Newsbytes (Washington Post-Newsweek Interactive wire agency), Nikkei Electronics Asia and AsiaBizTech.com. I also previously contributed to The Star, The Edge, The New Straits Times, The New Zealand Herald and various magazines. Currently, I train and advise managers and executives on strategies to optimize their use of social media and online channels to reach customers. My company, Trinetizen Media, runs media training workshops on social media, media relations, investor relations, corporate blogging, podcasting, multimedia marketing, online advertising, multimedia journalism and crisis communications. Vertigo Red Theme by Brian Gardner.